MORI, Akihisa, an associate professor of Graduate School of Global Environmental Studies, Kyoto University, Japan, is an author of Environmental Aid: Logic, Strategy and Evaluation of Environmental Aid for Sustainable Development (Yuhikaku, 2009 in Japanese and Institute for the Environment and Civilization, 2012 in Korean) and editor of Environmental Governance for Sustainable Development: An East Asian Perspective, (United Nations University Press, Tokyo, 2013), and Democratization, Decentralization and Environmental Governance in Asia (Kyoto University Press, Kyoto, 2012). EKINS, Paul has a Ph.D. in economics from the University of London and is Professor of Resources and Environmental Policy, and Director of the UCL Institute for Sustainable Resources. He is also a Co-Director of the UK Energy Research Centre, in charge of its Energy Systems theme. He was a Member of the Royal Commission on Environmental Pollution from 2002-2008. From 2007-09 he was Director of the UK Green Fiscal Commission. He also has extensive experience consulting for business, government and international organisations. 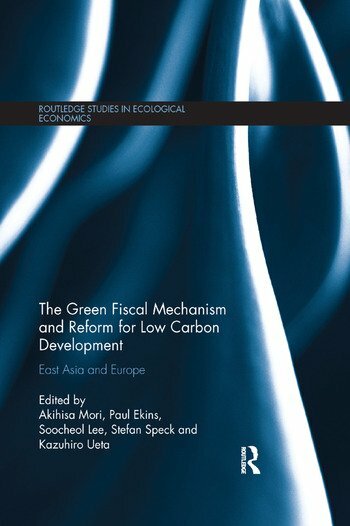 Paul Ekins' academic work focuses on the conditions and policies for achieving an environmentally sustainable economy, and he has published extensively in the field of environmental taxation, his output including the co-edited books Carbon-Energy Taxation: Lessons from Europe (with Mikael Skou Anderson) (Oxford University Press, Oxford, 2009); and Environmental Tax Reform (ETR): A Policy for Green Growth (with Stefan Speck) (Oxford University Press, Oxford, 2011). LEE, Soocheol, a professor of Economics, Meijo University, Japan, is co-author of A Model- Based Econometric Assessment of Japanese Carbon Tax Reform, Scientific World Journal volume 2012 (with Hector Pollitt, Kazuhiro Ueta) and Public Policy Issues on the Disposal of High-level Radioactive Waste in Japan, Critical Issues in Environmental Taxation, Volume XI1 Green Taxation and Environmental Sustainability (edited by Larry Kreiser, et.al. ), pp. 197-211, Edward Elgar, 2012 (with Kazuhiro Ueta), and an editor of Environmental Charge Systems of East Asian Countries: Features and Challenges, Kyoto: Showado Press, 2010 (in Japanese). SPECK, Stefan is an environmental economist with a Ph.D. in economics from Keele University in England. He is working as a project manager for environmental economics and policies at the European Environment Agency (EEA) in Copenhagen. Prior to that, he was employed as a senior consultant at Kommunalkredit Public Consulting in Austria and as a senior project scientist at the National Environmental Research Institute/University of Aarhus in Denmark within the EU-funded project ‘Competitiveness Effects of Environmental Tax Reforms’ (COMETR). He also contributed to the research project ‘Resource Productivity, Environmental Tax Reform and Sustainable Growth in Europe’ (PETRE) funded by the Anglo-German Foundation. UETA, Kazuhiro, a professor of Graduate School of Economics, Kyoto University, Japan, is an editor of CDM and Sustainable Development in China: Japanese Perspectives, Hong Kong University Press, 2012, and co-author of Measuring Future Dynamics of Genuine Saving with Changes of Population and Technology: Application of an Integrating Assessment Model, Environment, Development and Sustainability, Vol. 13, No. 4, pp. 703-725, 2011 (with K. Tokimatsu, R. Yamaguchi, M. Sato, R. Yasuoka, M. Nishio) and Capital Depreciation and Waste Accumulation in Capital-Resource Economics, Applied Economic Letters, Vol. 18, No. 6, pp. 519-522, 2011 (with R. Yamaguchi).